Since finishing college around 5 years ago, my creativity has come to a huge halt. Apart from blogging, I had noticed that I had completely stopped doing all arty things I loved; I used to enjoy nothing more than digging out an old scrapbook and doodling away or paining with watercolours, and not to mention taking a trip to London to visit the galleries, The National Portrait Gallery being my absolute favourite. 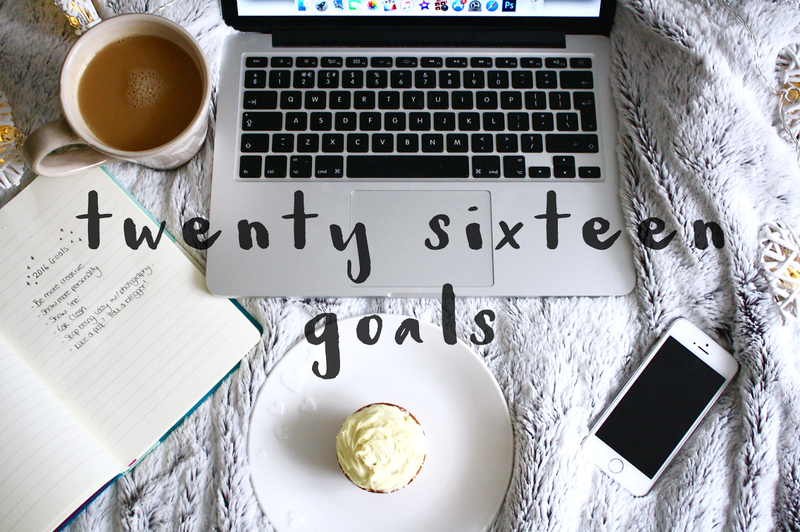 So far this year, I have tried to mix up my blog photography a little and I have reinvested in Photoshop. I've also tried to take time away from my laptop in the evenings and work on my adult colouring book. I'm hoping to invest in new art equipment soon so that I can fully get back into painting and creating hand drawn typography too. Show more personality on social media. I have whole-heartedly stuck to this one. Twitter is my favourite social media platform of all and I had noticed that I had been playing it a little safe with my tweets and only tweeting things I thought people would want to read/retweet, rather than what was on my mind. This year, I have changed things a little, even if it is the most mundane task that I'm doing, I've decided to tweet about it. There's no point in being a clone in blogging/social media as people are always looking for something different. I mean, who doesn't want to know that I'm spending my Friday night cleaning my bathroom? When I first started blogging around 3-4 years ago, I used to post a lot of outfit posts and photos of my face to show 'proper' swatches of products, albeit, a lot of the posts have since been drafted. When I visit somebody's blog, as much as I love to see pretty flat lays of products I would love to own, I like to see the writer of the posts too. It adds a more personal touch to the content. I've been trying to put my face out there more on Instagram and my blog, and so far I think it's working. Note: see my 'current every day makeup' post. Okay, okay. Last week may have been a bit of a write-off with the added help of a Dominos, Indian and lots of pancakes but aside from this, I've stuck to eating clean pretty well so far this year. My breakfasts generally consist of porridge, fruit or greek yoghurt and my lunches have been consisting of chicken salads on most days. If you get stuck for lunch ideas, I've found these lunch boxes particularly useful for sectioning up just the right amount of each food group; I tend to use the sections for chicken salad, pink slaw and croutons or fruit on most days. Stop being lazy with blog photography. I think that anybody with an iPhone will back me up on this one and agree that it's so easy to get comfortable with taking photos on it, instead of a DSLR due to it's ease of use. I mean, it only takes one tap to focus then you have all of your editing tools on your phone and it's an Instagram-worthy shot ready to go, plus it's a lot lighter to carry around with you. I had taken a glance back to my earlier blog posts when I used to use a DSLR for all of my photos and I noticed the quality of my images was so much better than that of my recent blog photography. Since the beginning of the year, I have been using my DSLR for every post and I have been very happy with the improvements in the quality of my images. If I like a post, tell the blogger. I have 100% stuck by this goal this year. I love nothing more than receiving comments on posts I've worked hard on and it makes everything just that bit more worth while; even if the comment I receive contains constructive criticism, every little helps to produce content that my readers will enjoy. If I have enjoyed a post that I have read, or even if I see an amazing photo on Instagram, I have gone out of my way to comment and let the creator know. It only takes a second. What goals did you set yourself this year? Did you set yourself any similar ones to these? Best of luck with your clean eating too!